Selena Wolf Berkley first visited the office of Women, Infants, and Children when her daughter, Amina, was only a few months old. With her baby girl wrapped snugly to her chest, Selena spent hours in the crowded waiting area, only finding solace in the provided nursing mother’s room. A 20-minute appointment at the WIC office can take half a day. Once she was finally seen by a WIC counselor, Selena was bombarded with questions and suggestions on basic nutrition and baby care. After being weighed, ridiculed about the number on the scale, and lectured on the food pyramid, Selena received 3 months of food vouchers worth approximately $40–$50 per month, enough to keep her family from having to live on ramen noodles for the foreseeable future. Selena never expected to end up in this oppressive and tacky taupe waiting room, filled above capacity with mothers and their hungry children, waiting for hours and being subjected to body shaming for a few bucks’ worth of food. Like everyone in that room, she would have battled the perception that relying on government assistance is a mark of failure, something that can be avoided through education and hard work. But Selena went to college, earned straight A’s, graduated from an exclusive master’s degree program, and got a job as an adjunct professor. She had always believed this path of higher education would be enough to let her achieve financial stability. 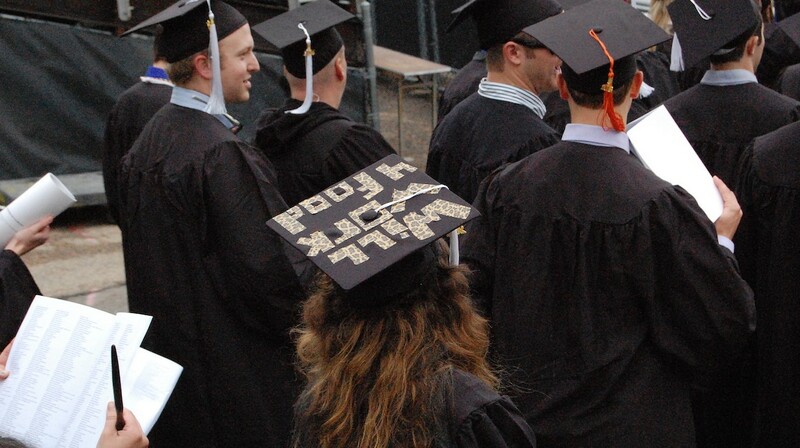 Instead, her degree put her in debt without getting her enough money to pay off loans and feed her family. Starting in childhood, we are bombarded with messages about furthering our education. It’s the key to success — without it, you may be doomed to financial helplessness. What we don’t hear about, while we’re filling out undergraduate college applications and applying for student loans, is that sometimes the key to success gets jammed in the lock on the door of life. Job markets plummet, putting the pressure on students to obtain master’s degrees to stand out. That means loan payments for two degrees, which come due as other expenses of adulthood pile up. Our country glorifies higher education, with an increasing focus on graduate school, as the infallible path toward financial well-being. But our employment system is unable to support this promise. Instead, as it becomes a minimum requirement for many positions, the employment value of a master’s degree is tanking, while the cost to obtain one skyrockets. Talking about education costs on a large scale, and neglecting to see the individuals, strips the humanity from those, like Selena, who have been failed by the system. We need to talk not only about the cost of education, the trillion-dollar student loan balance, and the gender pay gap, but about the real stories of women who trusted that a culture that demands higher education would prioritize supporting that education in an attainable and affordable way. Graduate students owe a disproportionate amount of the national student debt (currently $1.3 trillion), as reported by U.S. News & World Report. They make up 16% of the student population, but owe 40% of the debt. And for the most part, nobody is helping them plan for the financial ramifications of getting a degree. Schools generally don’t require students to meet with a counselor at the Bursar’s office who can transparently discuss loan payments and encourage them to factor in the additional bills of adulthood. The costs of higher education are even greater for women, who are much more likely than men to leave the workforce in favor of familial commitments. Childcare alone can cost $10,000 per year, per child, and most of that falls on women. As an alternative, women are more likely to give up career advancement opportunities, or even give up their careers completely, in order to care for a child, resulting in massive loss of earning potential as their families grow. No educational institution has offered a tuition discount to women who continue to pay the same amount as men for their education only to ultimately earn less. Loan officers are not accounting for the difference in salary when calculating a woman’s ability to rise above the weight of her student debt. Without all of the facts and total transparency, how can individual women make the best decisions for their lives when obtaining an education? Since finding herself unexpectedly in the WIC office, Selena has continued to focus on improving her family’s financial health. Believing that her field experience is valued over education, she has shifted her priorities to growing her own business, unrelated to her degrees. Between them, Selena and her husband have three streams of income, owning two small businesses in addition to her position as an adjunct professor. Yet they continue to struggle without the higher-paying employment a master’s recipient would expect. In many cases, this higher education door remains open and full of promise, and eventually leads to a comfortable, financially stable life. However, we need to make noise about the women, in particular, who are unsupported when they adhere to the demands of our employment system, which frequently requires higher education without rewarding it. What is missing from the discussion about higher education are the real stories of women like Selena. Women who trusted that a culture that demands higher education would prioritize supporting that education in an attainable and affordable way. Women who have proven that they are hardworking and committed to advancement, yet find they are being punished financially for that commitment. Real women who have achieved so much but can still be found waiting for food vouchers or stuck for years at a low-paying job and feeling crippled by the depths of education debt. These women deserve better. Held up by the good graces of chai tea and phenomenal friends. Editor at Hold the Line.